I was warned by my friend to leave my healthy eating in California and be ready to experience Pennsylvania Dutch deliciousness. I arrived late on Tuesday night and drove through Philly to the burrow of Silverdale where every home looks like a doll house and vast lush green yards surround each one. 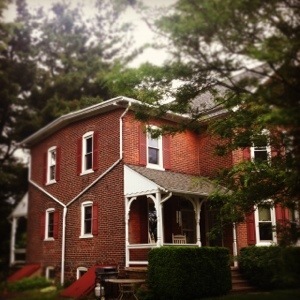 I woke up late Wednesday morning in my friends homeIt is (a 100 year old farmhouse). I made my way down to the charming country kitchen. I was drawn to the window over the sink that looks out to the red barn garage in the back and small cemetery behind the church next door. I turned around to the kitchen table and was introduced to my breakfast choices: Shoofly Pie, Hard Take Coffee Cake and Funny Cake (with coffee, of course). Which one to choose? With the echoes of healthy eating ringing in my ears, I choose the most “breakfasty” one- the coffee cake. Pie for breakfast? Long ago, in my teenage years, I must confess that cold apple pie was a favorite breakfast treat (with ice cold milk of course) but now as a full flegded adult the closest thing I get to pie for breakfast is doctoring up steel cut oatmeal with cinnamon apples. Anyway, Angela told me that the hardtack coffee cake was best dipped in coffee and who was I to argue? It was like a soft biscotti and yummy. 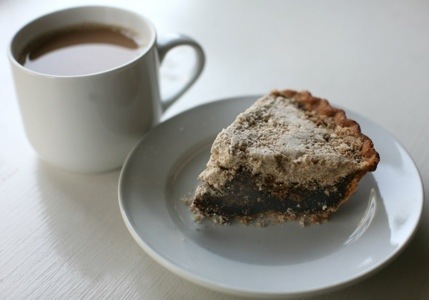 I can’t remember if I tried the Shoofly Pie that morning or not, but it actually became my favorite of the three. Shoofly pie is made from flour, butter, molasses, brown sugar, cinnamon,and salt, and sometimes nutmeg. Traditional shoofly pies are made with either a “wet bottom” (soft filling and crumb topping) or “dry bottom” (crumb topping mixed into the filling). Most of the ingredients will keep in the larder for the winter, even without today’s conveniences. Perhaps that’s why its history is such a long and fascinating one, and why folks who abstain from modern conveniences such as electricity – the Amish, for example – still make the pie. Legend says that it was these ingredients that survived the trip from Germany (I read that the term “Dutch” is actually a misnomer, a corruption of the word Deutsch, which means German.) and their ingenuity caused it,s creation. Like the colonists already in America, these settlers ate pie at any time of day. According to food historian and cookbook author William Woys Weaver, shoofly pie is still served for breakfast among today’s Pennsylvania Dutch. It is a credit to the McMcheal kids that any of it was available the second morning. This is good stuff. Wildly unhealthy delicious scrumptious stuff. It is said that the molasses caused the flies to flock to it. Whatever the reason for the name, Shoofly Pie gives us a glimpse into history, a time when fruit and vegetables were not always available from the grocery store and bakers were forced to be creative with their stock. The order of the day was survival. Survival is important. We wouldn’t be here if the first colonists didn’t survive. Survival gets us through the tough times, the shocking times, the times that change our lives whether we want them or not. Survival is necessary but it is not meant to be the only mode we live in. Sometimes I think we get stuck in survival mode. The funny thing about survival mode is that after the circumstance we need to survive is over, survival mode can become unhealthy one. The same things that caused us survive, don’t necessarily cause us to thrive. Take Shoofly Pie, for example: it was healthy for the colonists because it helped them stay alive during the long lean months. In our current world, Shoofly Pie (although decidedly delicious) does not a healthy breakfast make. Today, we have refrigerators and grocery stores. Today, we can do more than survive – we can choose to thrive. It is time to thrive. We can choose to eat healthy (unless on vacation), choose a job we love or choose to love the job we have, have healthy relationships with others and certainly have a healthy relationship with ourselves. You can do more than survive. There are more options than those you know (your past) and those that keep you going (your habits). You were made to thrive. There is more available to you than just surviving your situation. Change is possible. It isn’t easy, but it is possible. It is time, my friend, to ask yourself if you need to change modes. To leave behind your “survival tactics” and learn a few new “thrive tactics” instead. It is time to look at what you have available to you and create something new. You have so much more than you realize. We have the luxury of being healthy in our day and age in every area of our lives. You have a God who is willing and able to move you from one mode to another. What mode are you in? What things need to change? Change – transition – new commitments… I am there! Seeking God for all the strength, joy and hope in it all! What a great vacation! We are all so blesses to have you home safe. I would love to go there some day. You are so right we can do all things through Christ, love that verse. Your words are so encouraging thank you!